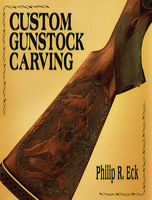 This paperback edition of Custom Gunstock Carving gives in-depth instruction on the cutting and carving techniques that make up the gunstock carver’s art, from preparing proper working conditions to selecting a pattern to the cutting itself. He also discusses using different types of wood, preparing the surface for carving, and locating design sources. Featuring an impressive selection of full-scale patterns, this book is essential for any shooter looking to add a personal touch to his or her weapon. America’s leading stock-makers have contributed photographs of their handiwork and full-size line drawings of checkering and carving patterns to illustrate the art of stockmaking. 336 Pages – Hardcover. A complete home workshop reference for the amateur and expert carver and checkerer. Included are ready to use patterns as well as detailed instructions and techniques on how to make gunstocks look better, feel better and grip better. 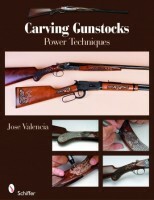 With 250 clear color photos and concise text, Jose Valencia takes readers through all the steps necessary to create unique carvings on rifle or shotgun stocks. Learn to create and apply patterns, remove factory checkering, and use a high speed power pen and accompanying bits to create elaborate scroll, basket weave, and maple leaf patterns, along with realistic wildlife carvings. Adapting patterns to curved surfaces, sanding, and finishing techniques are also shown and explained. Seven patterns are provided for each of the carvings. A color photo gallery is also provided for further inspiration. 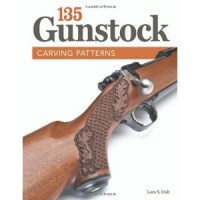 Once readers have mastered the techniques for carving and finishing these patterns, they will be able to transform standard gunstocks into works of art that will be appreciated for generations. Create one-of-a-kind functional artwork that will be cherished for years to come with this treasury of classic gunstock carving patterns. You’re sure to find the best carving pattern here for your next project. From basic checkering to dramatic relief carved scenes, nationally recognized carving artist Lora S. Irish presents 135 great gunstock patterns featuring traditional sportsman and hunting-related themes. She offers an array of excellent choices for every skill level, from beginner to expert, so you can start with a basic pattern and tackle more intricate designs as your experience in gunstock carving grows. The patterns in this book are designed for rifle stocks, but are just as applicable for knife handles, pistol grips, or duck calls. And while these patterns are specifically designed to be relief carved with hand tools, they are equally usable with power carving tools, woodburners, laser engravers, and sand blasters. Patterns include animals like deer, elk, moose, bears, mountain goats, and puma, plus birds and waterfowl such as quail, pheasant, ducks, geese, eagles, and more. Designs are provided for panels, ornaments, banners, scrolls, oak leaves, fishscale, basketweave, and checkering. The author offers advice on choosing patterns, wood, tools, and carving methods, plus tips on whether to start from scratch or use a kit.